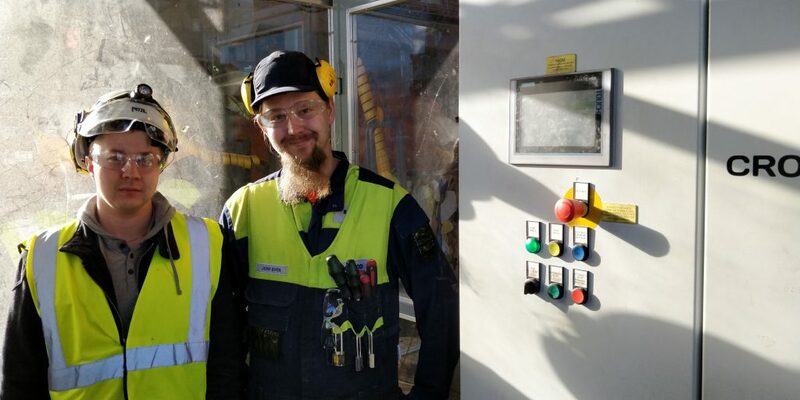 Cross Wrap Ltd.’s automatic bale dewiring machine helps the Sonoco Alcore core board mill in Kotka to improve safety and decrease manual work by removing the bale wires from the raw material bales. Paper mills have long traditions in Finland. The newly revised Sonoco Alcore Karhula core board mill is no different. The mill site has long history starting from the late 19th century, when the mill was developed to manufacture cardboard, and it has been running since. Today the mill has approximately 70 workers and its 65-meter-long and 3-meter wide core board line produces roughly 80 000 tons of OCC-based core board for core manufacturing. Sonoco acquired the mill in 2006 and has proactively developed and invested in it to become one of Finland´s top board manufacturers for the paper core business. The Sonoco Alcore Karhula board mill produces core board mainly for the Sonoco´s own core manufacturing needs and the material is transported worldwide to different Sonoco´s mill and factory locations. The factory operations manager Janne Ruoti sees, that the future for the mill is brighter than ever with its newly revised automatic bale dewiring and pulper line. He has been working in the mill for several decades and knows how the operations have changed during the different stages of the mill´s lifecycle. At the Sonoco Alcore Karhula board mill the core board manufacturing line starts by dewiring the incoming raw-material OCC-bales. The bales are buffer stored outside and then loaded to an angled conveyor that runs up to the Cross Wrap Dewiring machine. This feeding conveyor and the Dewiring machine are automatically paced to run with the pulpers. The feeding conveyor is quite long to give room for good quantity of bales. This gives time for the operator to load the line with steady pace and to unload arriving trucks at the same time. The Dewiring machine removes the bale wires by grabbing them on both sides of the bale with patented grippers and then the machine´s front cutter cuts the wires. The material is then conveyed forward, and the bale wires are coiled automatically into a tight bundle. This way the metal is separated from the material stream. 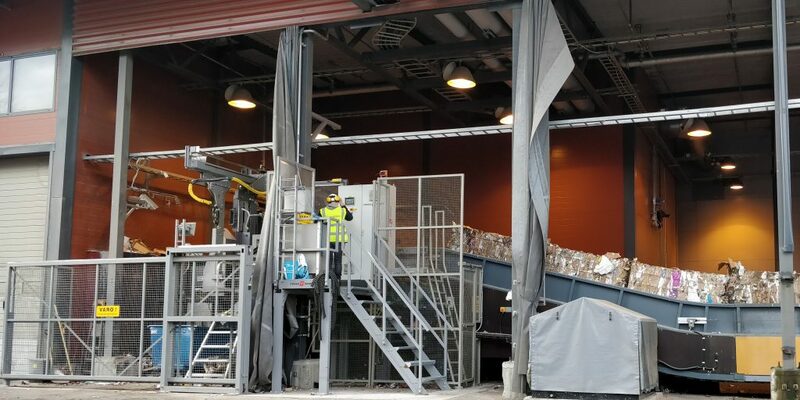 The Sonoco Alcore Karhula board mill can sell the coiled bale wires for recycling and the wire separation also cuts back on the maintenance costs for the pulper. – Before we needed to pay to get rid of the uncoiled bale wires and the pulper emptying was very labor-intensive operation. Today we get money back from the wire recycling and the pulper maintenance work load and costs have decreased significantly. – Janne Ruoti explains. After the Dewiring machine the raw material is conveyed up to the large first stage pulper and then the material is run thru a second pulping stage. The plastic and metal particles are separated in and after these processes and pushed out from the material stream. This reject material is then compressed to get rid of access moisture and then it is transported to a biomass power plant. 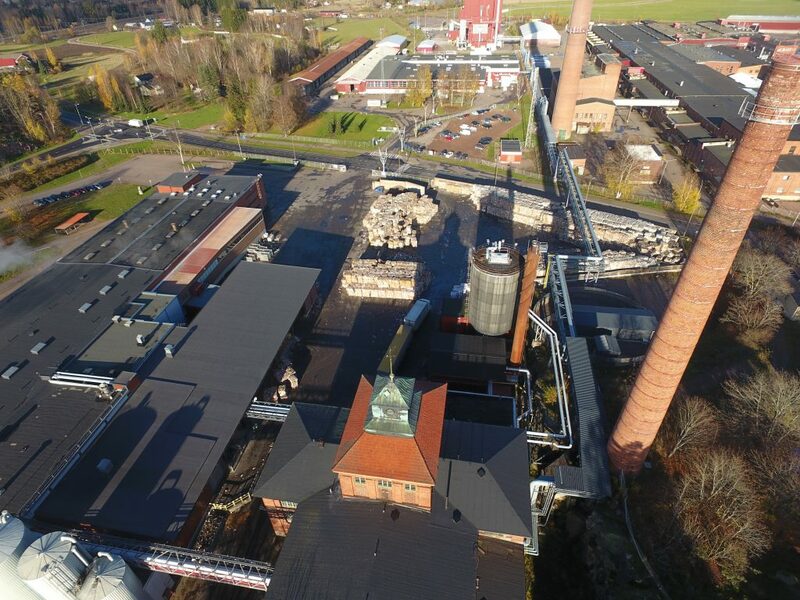 The power plant is located just next door to the mill, where the reject is burned for energy and steam to run the mill and to give heat and energy also to Kotka city. From the pulping stages the OCC-pulp runs thru a chemical treatment and then ends up to the beginning of the 65-meter-long core board mill and drying line. The line ends to a state-of-the-art stacking line. The final products are transported to different Sonoco core factories around the world. Karhula board mill uses baled OCC as its main raw material. This is collected mainly from Finnish recycling operators. The bales are buffer stored outside at the mill yard. This storage needs to be constantly refilled to feed the mills hungry system. Fast changing raw material inventory helps to save space and this way the bales don’t degrade, and the material keeps in somewhat good condition. – On the negative side the Finnish climate does have impact on the bales in the winter time, when the moist and freezing sea breeze coming from the Gulf of Finland can make the bales ice up, – Janne Ruoti trots out. These conditions, the mill running targets and the varying bale size created the template for the machinery selection. Also, the offers and the co-operation possibilities between the machinery providers and the mill played an important part, when the project team debated on the machinery acquisitions. 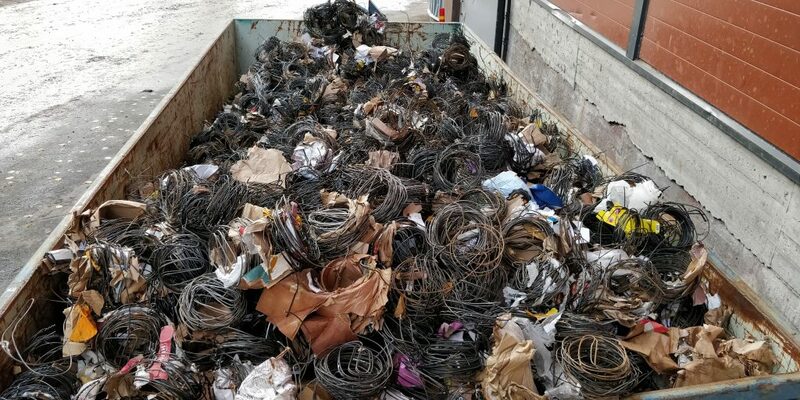 – For the latest revision to the core board line we studied a lot of different bale handling and raw material pulping solutions and saw the benefits in automatic bale wire removal. Now that we have finally had the machinery running steadily, we can see the differences when comparing the new system to the older one. Today we need to clean the pulper much more seldom, which is good for the operation flow. – Janne Ruoti explains. The dewiring machine differs from the traditional bale breaking or bale opening by removing the bale wires from the material stream. The Cross Wrap Dewiring machine cuts, separates and coils the metal wires so that they are easy to recycle. This means, that the core board producing line is no longer getting steady stream of metal wires to roll around in the pulper. Smaller quantity of metal wires going to the pulper means less pulper blade wear and pulper run downs. – This Dewiring has two kinds of traits for us. On the other hand, we need some amount of metal wires ending up to the pulper, where they help to separate the plastic and metal material from the OCC, but on the other hand the automatic wire removal creates less need for pulper cleaning and maintenance. Now that the machinery has been running for a reasonable period, we can see that the bale quality fluctuations give us the possibility to run the machinery so that there are enough wires going thru to the pulper. – Ruoti discloses. Sonoco Alcore Karhula board mill main target when updating the bale handling line was to improve safety. The safety improvements were possible due to the Cross Wrap Dewiring machines automation and its safety equipment such as safety fences, remote control, laser and sonar censoring plus safety key operation. – Today the operation runs smoothly, and we need only one operator to feed the line with OCC-bales. This work is easy and unrushed because of our long feeding conveyor that gives room for actions such as unloading the trucks and piling up the bales to the storage area. The steady working pace is also a key factor that improves safety at the work site. – Ruoti explains. The Cross Wrap Dewiring machine gets also positive comments from the loading operator Markku Piiroinen who notes, that the machine has been very easy to use and operate. He also wants to thank the Cross Wrap design and engineering team, which has been guiding and helping the machine upkeep along its paces at Karhula board mill. The Sonoco Alcore Karhula board mill improved bale dewiring and handling operation update was a true pilot project. The Cross Wrap Dewiring machine has been thru different evolutions during the incorporation period where the mill machinery has been updated. The steep learning curve between the different evolutions has given important know how to Cross Wrap and to Sonoco Alcore Karhula board mill personnel. – Good cooperation has been an important part of this kind of uncharted way of finding the best possible solution. The Cross Wrap personnel has been very helpful and keen on improving the machine to work the best way possible in our operations. – Ruoti states. Getting the most out of the chosen machinery is a learning process, where the mill personnel need to be on close contact with the machinery provider. The Sonoco Alcore Karhula board mill electrician Joni Sven appreciates the way engineers at Cross Wrap do listen, teach and customize different things regarding the Dewiring machine. – There are some things such as the cold weather factor and the bale quality fluctuations, that create challenges for bale dewiring, but the Cross Wrap machine has proven it self during the different evolutions and updates. Now the fact, that the machine has dewired over 248 500 bales and is continuously running strong, shows a textbook example of proper engineering. – Sven tells, and gives credit also to the whole Cross Wrap design team and Cross Wrap engineer Henry Blom, who was at the site doing all around machine inspection during the story interview. Karhula board mill daily capacity is roughly 250 tons per day and the production line runs 24/7. All the line improvements aim to create more stabile material flow, less maintenance costs and improve safety. These improvements are needed efforts to keep up with the changing world challenges. The Cross Wrap Bale Dewiring machine is a good example of a machine, that is born from the need of the users to do something that is necessary to keep capacity high, lower the running cost and to advance safety. – The OCC-material costs seem to be quite stabile, though we have seen price changes during the years. The tightening Far East paper import regulations may have some effect on the pricing in the future, but just now the market prices have stayed steady. And luckily, we do have smoothly running mill operation to back it up. – Ruoti sums up. The Sonoco Alcore Karhula board mill has been constantly aiming for more modern operations and been thru multiple machinery updates and revisions. The mill walls do still tell the long story but everything inside is new and high-tech. Janne Ruoti sees Sonoco as a good owner because of the constant improvement and steady business strategy. There are all the building blocks present to tackle the future.